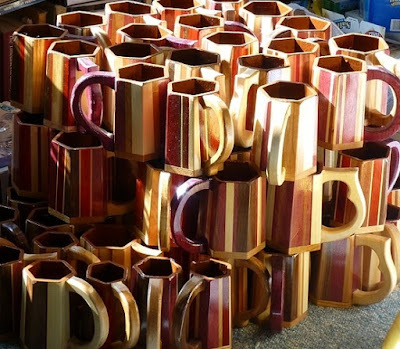 Rural Revolution: Tankards are available! Our tankard page is now live! Please click this link to see what stock we have available. Remember, these tankards are suitable for either hot or cold beverages. They should be hand-washed and never put in the microwave. A few things need explaining. First, shipping. The website where the tankards are listed has limited options for shipping. We ship USPS Priority Mail, which costs almost exactly $10 for domestic shipping for one tankard. If any additional tankards are shipping to the same address, we’ll need to add $2 for each additional tankard. However if tankards are shipped to different addresses, each address will require that $10 base shipping charge. We’ll notify you by email if any additional shipping costs are incurred. Second, we’re offering a special limited-edition Rural Revolution tankard. This tankard has solid-wood sides (as opposed to multi-wood sides) of alternating maple and walnut. 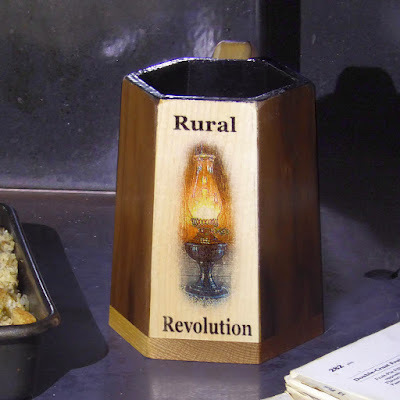 On the face of the tankard is one of my oil lamps and the words Rural Revolution. They’re absolutely beautiful! Don actually talked me into signing the bottoms of the tankards as well (he seems to think that’s a selling point, ha!). UPDATE: Oops. I accidentally hit "delete" instead of "approve" on a few comments that came through. Unfortunately there's no way to retrieve deleted comments. Please accept my apologies! Thank you for making these available again! For those that have not seen these up close and personal the photos do not do them justice! Yaaaa!!! Got my Limited Edition on order! Yaaaa!!! I have my Limited Edition on order! just ordered one for my sailor daughter in japan. she saw them before they went off line and fell in love with them. we could not get one ordered in time. if it doesn't get here in time for Christmas, she has a birthday in feb. either way, it will make her day. Have also order my limited edition and was wondering ig Don signs them along with your signature? If you let us know your first name and zip code so we can tell which tankard is yours, he can sign it too. Couldn't pass up a signed tankard, thank you Patrice! About how many ounces do they hold? It varies. Of the ones currently on the webpage, the smallest will hold about 24 ounces, the largest around 30. I'm sorry, Mike -- we've already shipped your tankard.